I am adding new dates to the TIARA TROUBLE book signing tour. Mark your calendars for Saturday, October 12, when I will be at the Lewisville, TX Barnes & Noble from 1–2pm. BARNES & NOBLE, y’all! That’s like a real bookstore and stuff! I just got official word back on it yesterday, but I spent most of last night daydreaming about what I would wear, how I would do my hair, wondering if I should try to match my outfit to my book cover, or just go all black so that the book cover stood out against me when photographed. I don’t want to clash with my book! But I don’t want to look like a ninja either. Destinee isn’t an all black kind of character, and since I am her envoy to the real world, I need to represent her style as best I can. I finally decided on wearing a sweater that picks up the color Destinee is wearing on the book cover and black trousers. So, when photographed, the light background of the cover will pop against me, but will still tie together nicely. I haven’t decided on my hair, or my shoes, yet. Leslieann knows me well enough that her first email this morning was to ask me what I planned to wear to the B&N event. Ha! I am especially excited for this one because a B&N signing is a hard get for a new author out of a small press. Most small presses use Print on Demand publishing, rather than offset publishing. With offset printing, a camera ready copy of the manuscript is printed from plates. Offset, or Traditional Printing happens in bulk for a much lower cost, and allows presses to make better sales deals with buyers. Say you are an author on Biggest Publishing House Ever’s list. When you sell YOUR NOVEL, they will use marketing tools to determine how many of your books they should print, and will do it all at once with offset printing. Then, they sell those books to bookstores in batches. Maybe Your Local Bookstore buys 20 of them. If the book sells well, Your Local Bookstore will keep ordering more to put on the shelves. If the book does not perform, Your Local Bookstore may do a couple of things. 1. They might put your book on sale and hope the new, lower price makes it move. 2. Send it back to the vendor who sold it to them for a credit. If you are an author with Independent Press House, when you sell YOUR NOVEL, it will likely be printed on demand. Instead of plates being made, etc, etc, a digital copy goes to the press, and they print each book as it is ordered. It is a much more expensive way to publish, and that cost is passed along to the buyer. YOUR NOVEL will be available to everyone on every major retailer’s website, but might not make it into a store because a) A small press is less likely to work with a distributor whose job it is to talk national chains into carrying your books in stores, b) a store is less likely to purchase a POD because they cost more AND they are non-returnable. Whereas books they buy from offset presses can be returned for credit if they don’t move, POD books cannot. Your Local Bookstore is just stuck with your books if they can’t sell them. When bookstores do a signing, they need to sell about 30 books in order to offset the cost of the event. If your book is a POD, the risk on an unknown author is not worth the work of setting up the event. That’s not to say a bookstore won’t let you come in and do an event if your book is POD, it just means that your sales pitch when asking to hold or be part of an event needs to be that much better. Some bookstores are sensitive to the plight of the indie press, and they hold semi-annual events allowing a certain number of authors to come in and do signings. With the larger group, the cost of holding/promoting the event does not really change, but the likelihood of selling 30 books increases. That doesn’t mean they will order 30 of your books, but it does mean that whatever of yours they have on hand, you’ll be there to sign. And, in these events, bookstores will often let you bring your own books in to sell on consignment. The better prepared you are to pitch your novel, the likelier you are to be invited to do an event. Tomorrow, I’ll tell you what to do to get prepared. Maybe I’ll know what I’m doing with my hair by then. I tend to write like this: Writewritewritewritewritecollapse. Then, I go back into my document the next day and delete the last two pieces of writewrite, pick up from writewritewrite, and start all over again. I find that I can usually get out about 5,000 good words, with 2,000 or 3,000 that either don’t belong right in that spot, or don’t fit at all. I hit a really good streak last night, getting Destinee out of some physical peril, only to have her wake up to social peril. Then, I wrote her out of the social peril. What I need to do tonight is scratch that “wrote her out of the social peril” bit and stretch that conclusion. How much of yourself can you put on show and still maintain control of your image? How much of your image has to do with what you show, and how much has to do with what you tell? At what point does empowerment become embarrassment? I’d say it’s different for every woman. And if you can suss out those issues and catch a killer at the same time, I’d say you deserve a nice, big slice of pie. I need to give Destinee some time to marinate in the juices of her latest social debacle and soften up her self-confidence so we can get some character growth out of her. Another quick note about writing, since that’s what I’m spending all my free time on right now. One of the hardest things, for me, is staying in character. It is very easy for me to conceive of ideas, plot points, twists and turns, but staying in character is difficult. When you are writing in first person, how your character acts and reacts is what drives your plot. Getting out of character can ruin a scene. Destinee is an optimist. She is a bright girl with a low-level education, whose vocabulary and speech patterns are a mix of small town Alabama and national pageant interview training. She hasn’t read many of the Classics, but she is very well read when it comes to current events, and she would surprise you with her knowledge of geography and politics. She absolutely cannot work higher math, but she is a savvy business woman and keeps her own accounting. She is incredibly confident in the way of professional athletes, in that she can strike out in a major way, then get up again swinging without losing her sense of value or worrying that she’s not good at her game. She looks at the world through the eye of a coach, but she is not critical until it comes to mean people. And, she is completely independent, but wants to be close to home. She has chosen to live next door to her family because she loves them, not because she’s afraid to be without them. Destinee is very different from me. I am cautiously optimistic, at best. I am well educated, but I have not spent nearly enough time on anything of real importance. I am not an entrepreneur. I do not have the same kind of confidence. I am not fearless. I prefer bagels to bikinis. When writing in first person for Destinee, it is easy to project my own ways onto her. I spent a couple of hours writing a scene, but it just wasn’t feeling right. I finished it out, slept on it, and woke up realizing the problem was that Destinee wasn’t acting like herself. She was acting like me. Where Destinee should have taken a few seconds to assess her situation, then taken full control of it (because she’s Destinee Faith Miller, ya’ll), she had assessed the situation and allowed it to consume her, never acting, only reacting. If you slap me, I will gape at you and wonder why you hit me, and I will worry that if I slap you back, you’ll slap me again and it will hurt worse, and I will try to figure out how to get away from you without any more handprints on my face. If you slap Destinee, she’ll slap you back harder and tear out a hank of your hair for good measure. So, if I write into my personal comfort zone, the scene veers off in the wrong direction, changing the course of the entire novel–and that’s why I needed to rewrite so much. When I signed with Cozy Cat Press, several of the authors eGreeted me immediately, making it feel like a real publishing home. Bart J. Gilbertson was one of those. 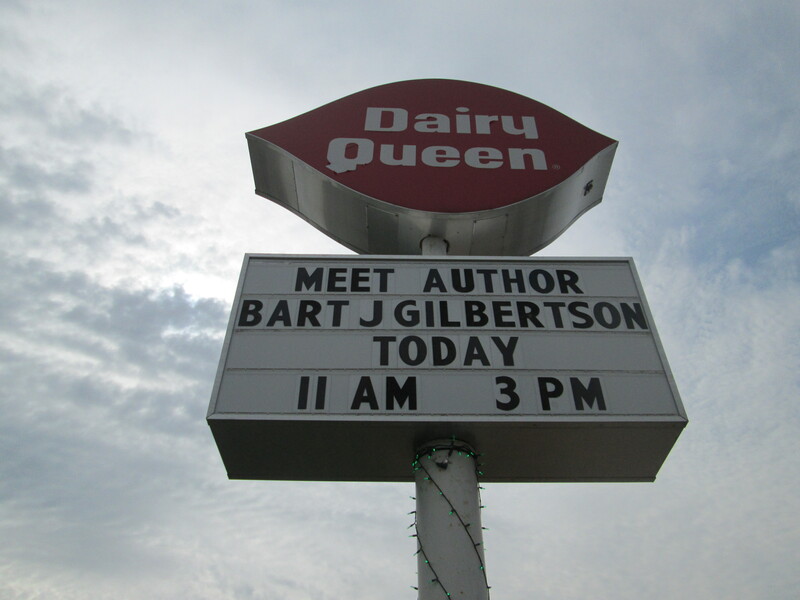 That very week, he was launching his book in a brilliantly creative way–at the Dairy Queen! Dairy Queen has all the best stuff. 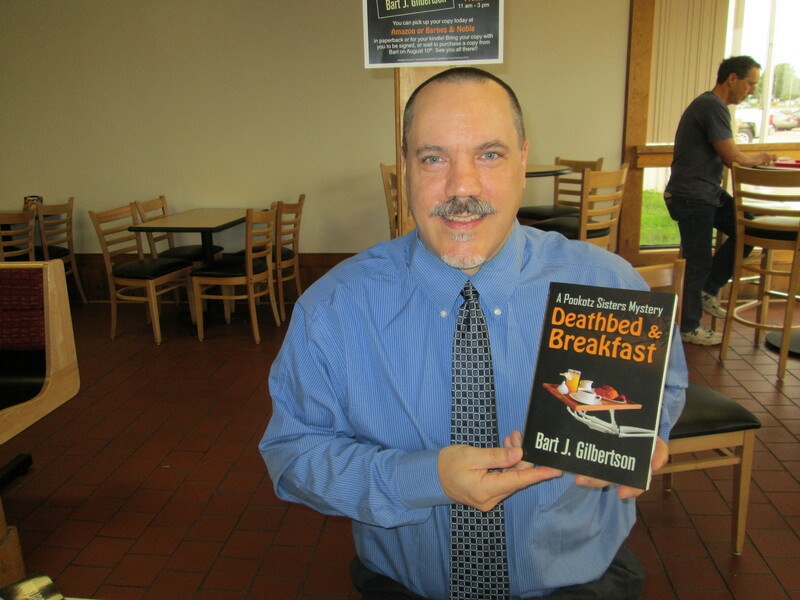 I bought his debut nove,l DEATHBED AND BREAKFAST, just days before it shot to #1 Free Cozy Mystery, #3 Free Humor, and #15 Free Mystery on the Amazon hit list. The Outside Lane: How did you get started writing? Bart J. Gilbertson: I really didn’t pay any attention to books until the 5th Grade when my teacher, Mrs. Moser, introduced me to the Prydain Chronicles by Lloyd Alexander. It was a 5 book YA Fantasy series that revolved around the adventures of a young man named Taran and his companions in a classic good -vs- evil backdrop. But it was more than that. It was the story of how a young boy became a man and found his place in the world, the meaning of true friendship and self value. Never before had I been so enamored by a book, let alone 5 of them! I got to create my own mental interpretations of the words in front of me. It was magic! The seed was planted and I yearned to write my own adventures, and I began to do just that. I have been writing ever since. TOL: I love that a teacher and great books were what inspired you! Where do your ideas come from? BJG: I would like to take credit for all of the ideas, but I can’t. Haha! The genesis of my novel, Deathbed & Breakfast, was a result of my sister and I tossing some ideas around late one night after she had just told me about a book she was reading at the time by Joanne Fluke. Before we knew it, we were laying the groundwork for what would become the first novel in a series I have planned out which centers on the amateur and comedic sleuthing antics of two sisters, Edna and Mildred Pookotz, who run a small town Bed & Breakfast. We laughed and joked and had a good time. Some of my ideas I get from real life experiences. Or I will take a current event that may have happened and think to myself “what if”. Ideas can come at me from anywhere at anytime really. One time (I know I should be cursed for life for this) I had a great idea for a scene during a prayer at church. Haha! I know, that’s terrible…but what can I say? TOL: What’s been the biggest learning experience from your first release? BJG: Two things really. First, I found out the importance of editing. You must edit, edit, edit and then edit some more. That is key. When I first turned in my manuscript to Patricia Rockwell (Cozy Cat Publisher and Editor), I felt I had a finalized masterpiece. I even had a great second twist ending in an Epilogue after the main story. And this was AFTER I had already gone through the manuscript several times on my own beforehand. Thankfully, Patricia had me make some vital changes and after it was all said and done, I could see that she was right. Having a good editor is invaluable. I appreciate Patricia and her patience with me very much. Second, the way books are being sold these days, it is SO important to be active in marketing your book. That is the second biggest learning experience for me. Instead of looking at it as work, I chose to look at it as a way to make new contacts and new friends. Have fun with it. I feel I’ve done just that. And I am still learning…on both counts. Bart and his book. The first release was a great learning experience. TOL: What are you plans for your next novel? BJG: Edna and Mildred will be at it once again, solving another murder in the town of Pleasant Lake, Oregon. 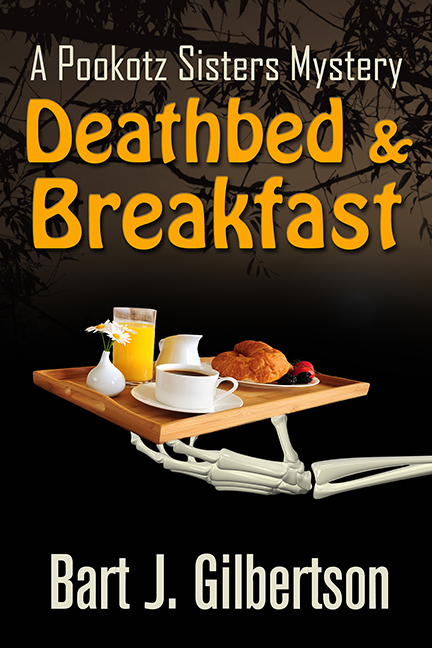 In the first book, Deathbed & Breakfast, it was their first foray into the investigative world as they worked with local sheriff, Jake Blackwood. In the next novel, they find that have a real taste for it and become much more involved. I think the readers will see them begin to develop and blossom more into the characters that they are destined to become. The cook Felix will be as obnoxious as ever…haha! A lot of people have told me that he is their favorite character, so don’t worry. More Felix to come! The book is in the preliminary stages right now. Outlined mostly, but the actual writing will begin shortly. I have other ideas for both short stories, stand alone novels and another possible cozy mystery series as well. BGJ: I actually had submitted my manuscript to Cozy Cat Press about a year and a half ago, but it was declined. It was the very first place I sent a query to. After 18 more months of countless queries sent to agents and houses alike, and receiving rejection after rejection, I had almost given up on going down the traditional road and was seriously looking at self publishing my book. I don’t know why, but I decided to go back to the Cozy Cat Press website and see if they were even around. Not only were they still there, but they had grown considerably! When I first submitted to them, there were only 4 authors. Patricia Rockwell, Diane Morlan, Alan B. Boyer and Sharon Rose. This time, they were over 20 authors. I took the time to read each of their Bio’s, and in fact, I went to Amazon and purchased a copy of It Takes Two To Strangle by Cozy Cat author Stephen Kaminski and read the entire book that night. My fire was refueled. I knew Cozy Cat Press was the place for me, a perfect fit. I sent Patricia another email asking to resubmit my manuscript. She return emailed me asking me to send it to her again. This time it was accepted and a contract was offered. I was elated! I got to go to the place that was my first choice to begin with. Ironic. So here I am, a Cozy Cat author and loving every minute of it! TOL: So what about you? Who is Bart J. Gilbertson? BGJ: The author bio says it all. 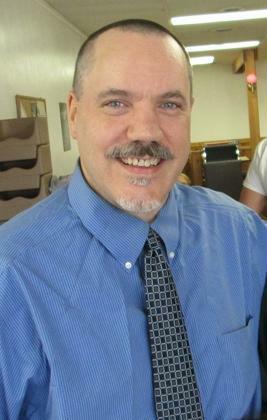 Bart J. Gilbertson is the author of the Pookotz Sisters Mystery Series. Although he was born in Wisconsin, he spent most of his youth and later years in the rocky mountain state of Idaho. He has been all over the northwest and it is his love for the lush green state of Oregon that inspired the setting for Pleasant Lake and its inhabitants. TOL: Thank you so much for stopping by to chat, Bart. I am really looking forward to being able to sit down and read your book! In the meantime, where can we find you? BJG: Thank you Lane for the interview! I had a great time. Here are some links I’d like to share.